Serge Ferrari introduces its newest indoor and outdoor furniture upholstery membrane – Stamskin® One. Stamskin One is an elastomer coated polyester jersey with an exceptionally soft and luxurious feel, similar to worn leather. 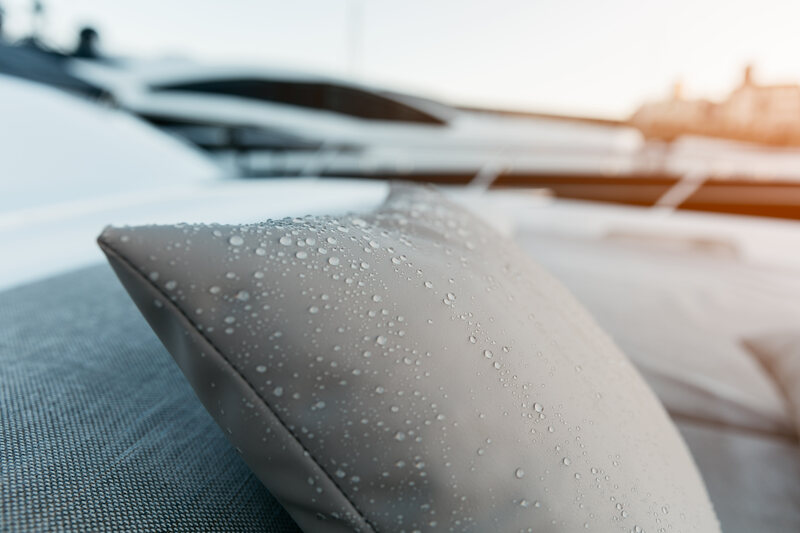 Its extreme durability makes it ideal for demanding environments such as restaurants, poolside seating, busy waiting areas, massage tables, and yachts. Stamskin One retains less heat from the body than comparable materials and has been tested to withstand most oils, lotions and cleaning products, including wet jeans, lipstick, sunblock, toothpaste, pen, coffee, red wine, pizza oil, mustard and ketchup. This material also provides exceptional tensile and tear strength, and outperforms traditional PVC products in bagging and folding tests, ensuring a long term like-new appearance. Available in 13 colors, Stamskin One is phthalate free and meets stringent IMO fire testing standards (MSC 307 -88) as well as NFPA 260 and 261. Serge Ferrari offers 7 year warranties on its durability and performance. Stamskin One is a natural evolution of the existing Serge Ferrari Stamskin® and Batyline® indoor and outdoor furniture collections. First introduced in 1978, these collections, including Stamskin Top and Zen, and Batyline Duo, Canatex, Eden, Iso, and Keops, are well-known for their modern style and durability within the cruise ship, hotel and restaurant industries. Stamskin One completes Serge Ferrari’s upholstery collection, providing designers and manufacturers with a new option for luxury and softness. Additional information and samples of Stamskin One are available from the company’s Pompano Beach, Florida location. Serge Ferrari is a leading manufacturer of flexible composite membranes used globally for the marine, furniture, hospitality, solar protection, architectural, building facade, acoustics, modular structure, and visual communication markets. For the last 40 years, Serge Ferrari has paved the way for sustainable construction, energy control, protection and renewal of natural resources and design through its Precontraint® technology for dimensional stability and durability, and the Texyloop® recycling program. Serge Ferrari North America is based in Pompano Beach, Florida and handles sales and service of Serge Ferrari products in the United States, Canada, Mexico and the Caribbean. For more information visit the company’s website: http://www.sergeferrari.com.